I met a Japanese lady inside Prashanti Nilayam, as my mother and I were waiting to meet someone. The lovely lady had a serene look that completely made us feel serene too - you believe in energy vibes that people carry around them, right? I do - there are people who exude amazing positive energy vibes that can instantly lift you up. This Japanese lady, whose name I do not know, is one such a person. ''You can go inside and ask for the person you came to meet,'' she told us. Her voice was soft, sweet and melodious. She looked poised, graceful and so lovely, especially when she speaks. It reminds me ever so gently that there are real people in this world who know how to speak respectfully and lovingly, without treating you like some one they can use later on in life. A majority of people, especially on social media, use such aggression to prove their point of view as superior, that when I meet people who are gentle in their manners, I feel utterly blown away. "You know about Onam?," I was genuinely surprised. 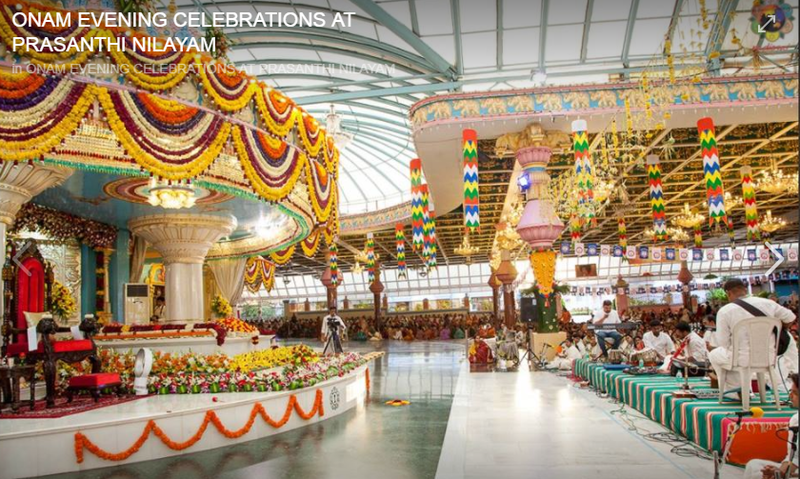 "Oh yes, it is such a beautiful festival and we celebrate it here so well in Puttaparthi. I was here last year during Onam celebrations too,'' she replied. I found this conversation amazing. Here I am talking to a lovely Japanese lady who knows about the festival and attended Onam in Puttaparthi last year as well. I asked her, "How do you find Onam celebrations here?" "It is so beautiful. But I also like to see people celebrate their different festivals here in Prashanti Nilayam, it feels good,'' she said. ''I live here, shifted from Japan after my visit to Parthi,'' she adds. I know the feeling so well. I have always longed to shift to Parthi and live there permanently. But the choices I have made do not permit me to do so at this phase in life. But I am certain that Prashanti Nilayam is where I am heading - when the time is right. Our conversation tapered off when the person she had come to meet appeared. In Prashanti Nilayam, the focus is always on exploring and understanding the Self on the spiritual path, not what other people do. That is why there was no formal ''Hey, how are you?'' or ''Bye, see you later'' that entered our conversation. We are strangers but seekers on the same path - we are bound to meet and leave. There is no need for formal etiquette and false pretensions here. The culture of spiritual seekers is based on simplicity and sincerity, not intolerance or the unnecessary stubbornness that ''Only my religion shows the right way." Among other things, I love this facet of life in Prashanti Nilayam - where strangers can be themselves and need not explain their purpose of being there. The world we live in seeks to judge us based on the labels we wear and the answers we give about ourselves. What is beautiful about Prashanti Nilayam is that all are treated as divine beings, no one needs to explain themselves to any others. Those people, who are used to spending their life pursuing wealth or gossiping about others or judging people's choices, manipulating situations, will not like this serene place called Prashanti Nilayam - in fact, they would probably hate the place. As some one who wants a simple and peaceful life minus the labels of luxury or designation, this place is my Heaven. Some day, I hope to live in this Heaven permanently. Inshallah. The feeling of being accountable to one self alone is simply divine - this makes you feel more confident, secure and responsible for growth on the spiritual path. Have you ever undergone an experience where visiting a place or meeting a stranger has altered your perception of what you want to achieve in your life?